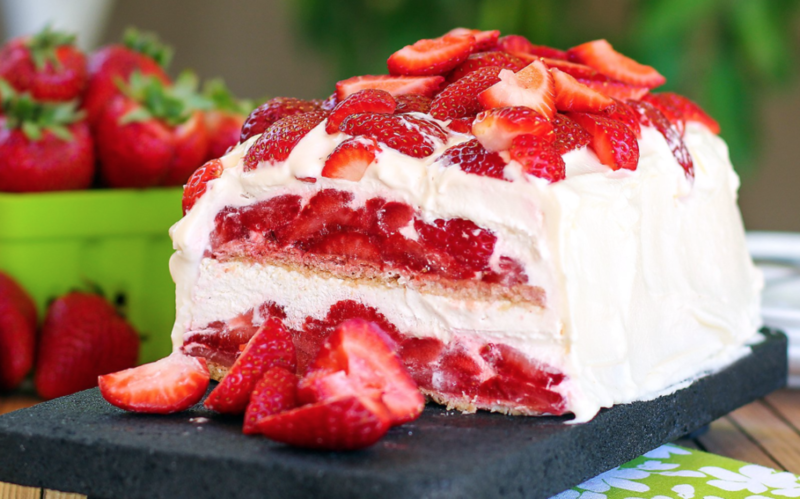 Strawberry Shortcake No-Bake Icebox Cake, Mouthwatering Strawberries & Cream! It’s the perfect strawberry dessert to celebrate Mother’s Day with this Strawberry Shortcake Icebox Cake! And what better way to enjoy the beginning of strawberry season than to have Mom enjoy a beloved American classic done with a new spin with layers of vanilla whipped cream, graham crackers, strawberries and vanilla whipped cream frosting. She will love it! Easily made from scratch. Only a few ingredients to mix, layer and freeze before adding the remaining ingredients and freezing again. Its simplicity yet with so much delicious flavors and texture is what makes it special. You can also include bananas, blueberries, or more graham crackers for a thicker “cake” consistency. The magic of the whipped cream will ‘mesh’ them together while it sits. It’s a real crowd-pleaser that won’t last long, which means making extra. But for now, let Mom eat her special cake! Enjoy! Delicious layers of vanilla whipped cream, graham crackers, strawberries and vanilla whipped cream frosting. So good! Reserve a handful of strawberries for garnishing the top of the cake. Place the remaining strawberries in a large bowl. Sprinkle granulated sugar over top. Stir to combine and allow to sit. In a tall bowl whip the heavy cream with an electric mixer until you can start to see a trail of the mixer through the cream. Add the vanilla and 1/4 cup powdered sugar. Whip until stiff peaks form (in other words when you turn off the blender and lift the beaters out of the cream, the cream stand up on the end of the beater). Set aside. Line a 9×5 inch pan with plastic wrap. Use enough to have excess that you can wrap over the top. Layer 1/3 of the whipped cream into the pan. Spoon ½ of the strawberries on top of the whipped cream, evenly. Top with a layer of graham crackers, breaking them if necessary to make them fit. Then add another 1/3 of the whipped cream, smoothing it out evenly with a spatula. Add the remaining strawberries evenly over the whipped cream, then top with another layer of graham crackers, also breaking them if necessary to make them fit. Pull the excess plastic wrap over the top to cover. Freeze for 3-4 hours. Meanwhile, add the remaining 1 3/4 cups powdered sugar, vanilla pudding mix and salt to the remaining whipped cream. Whip until it comes together. Refrigerate until ready to use. Remove the cake from freezer, unwrap the top of the cake and invert pan onto a plate. Remove the plastic wrap and frost with the whipped cream icing and sprinkle remaining strawberries on top. Freeze until ready to serve. Run your knife under hot water to warm the knife. Dry if necessary, cut cake. The knife should slide through the cake more easily. Repeat as necessary. Want Another Easy Delicious Dessert? Now Watch How To Make Mama’s Sweet Strawberry Cake!